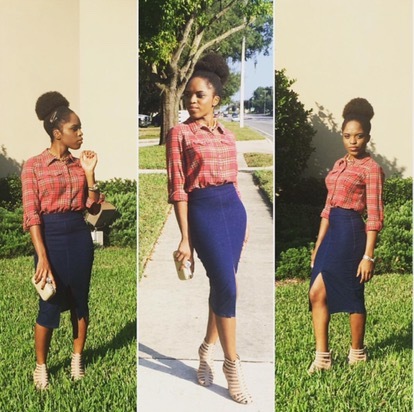 on @moyosmiles – a beautifully styled Chemical Engineer from the University of South Florida! Let’s jump right in shall we? ETP: Hi, please introduce yourself to us. 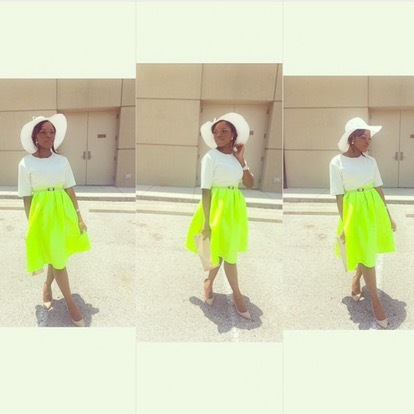 ETP: thanks Moyo, I really like this first outfit – where were you going this day? And where would you advise someone where this outfit to? Moyo: I went to church with that outfit. Well, plaid shirts are pretty versatile and can be dressed up or down. I did a little dressing up for this outfit and I’ll suggest it for a business casual occasion or lunch with friends. ETP: This outfit is beautiful! How else would you advise someone wears fluorescent clothing? The skirt was already speaking for itself and I wanted it to stay at the center of attention which is why I styled it with neutral colors. But for an even bolder statement to be made, I’d say you can decide to go all out with fluorescence popular known as neon colors. ETP: This fit is so classy – what do you feel about pattern in pattern? My advice: you either go hard or go home with patterns – You can’t be halfway. So if you want to do it, make sure you’re super confident in it. 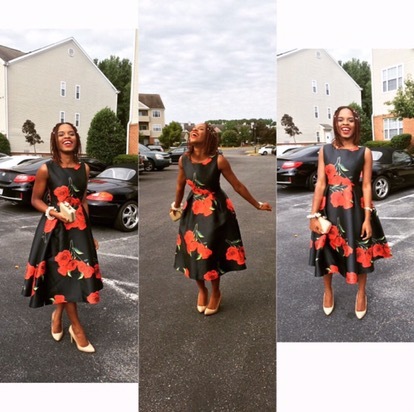 Moyo: MIDI dresses are my favorite piece of clothing ever! They are very comfortable and can fit in to almost any occasion. There really isn’t so much for different ways to wear a midi dress other than to switch up on accessorizing. For a more sophisticated look, a fascinator won’t be a bad idea and of course that depends on the occasion. ETP: Another question – what would you say influences your style and how do you describe your style in one sentence? Moyo: My style is mostly influenced by my mood and the foundation is to be as modest to the best of my knowledge as possible. ETP: This is beautiful Moyo, thank you for your time! Moyo: Anytime love, thanks for the feature. Moyo: My hope and vision for this group is to build a community of young women who understand their worth in Christ, encourage each other to grow in their relationship with Him and inspire others to see themselves the way God sees them – royalty. We hope you enjoyed this week’s style feature! If you have someone in mind that you would want ETP to do an Instagram style feature feel free to drop a comment or send an email! Previous ArticleETP Wins the Campus Heat Most Innovative Female Student 2016! Looking beautiful as always Moyo!